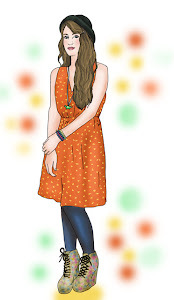 t*rexes and tiaras: Blog Tour: Death in the Stars.. 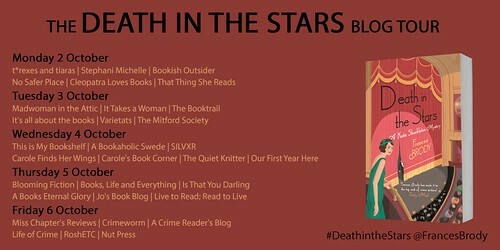 This week, I'm super excited to be a stop on the blog tour for Death in the Stars, by Frances Brody. I've read and enjoyed some of the Kate Shackleton mysteries series before, and have even been part of the blog tour for Death at the Seaside in the past, so I was excited to be asked to take part again, as I think these books are great fun. As I've come to expect, the book set the scene from page one. Ms Shackleton receives a letter containing a warning of things to come and keeps this in mind when she meets Selina Fellini and is asked to arrange an outing to see the lunar eclipse. Something terrible happens on that fateful night whilst everyone is busy watching for the eclipse and Kate is certain that she will find out the facts. I loved the gentle nature of the book; it builds up into a charming story which I've found is the case with others in the series, too. I was off the mark with my initial inclination as to whom was responsible for the murders, too. I think that the mark of a decent murder mystery is the ability to throw some plausible red herrings into the mix and this is most certainly what we have here. 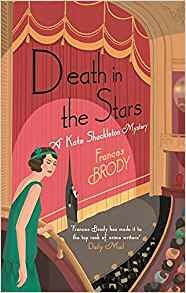 Dressing room lights, theatre performances and the roaring twenties setting make this a lovely book to escape into. 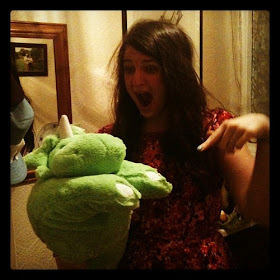 Stop by the other blogs in the tour for some more thoughts.. I'm so envious! You gave me Death at The Seaside for Christmas and I loved it! I've since acquired most of her other books 2nd hand so I'm v happy to know there are new ones on the way!